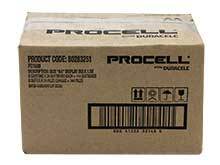 Duracell Procell batteries are reliable and long lasting power sources for your important work equipment. Each Procell AA battery provides high quality power with an impressive capacity. This convenient pack of 24 batteries is great for immediate use or long term storage thanks to a 7 Year Shelf Life, one of the longest among primary alkaline batteries. Procells are made to withstand the rigors of hard work, and feature a wide temperature operation range and Duracell quality manufacturing. Please review our Packaging Guide for a better understanding of how these batteries are sold. When placing an order, 1 unit purchased is equal to a box of 24 cells. A larger box of 144 is also available for purchase. I brought these batteries because we go though a lot of them. However, they seem to not last as long as the store brought ones. Very good batteries at a very good price. Are the batteries sub-packed in six boxes of four batteries each? Yes, just as you said. 6 boxes with 4 batteries in each. As Low As: $93.60 Ea.